70 years ago, in the hardest and fiercest phase of our resistance war against the French Colonialists, following President Ho Chi Minh’s initiative, on March 27th, 1948, the Party Central Committee released the Directive on enhancing the Patriotic Emulation Movement to encourage every force engaging in resistance war and national construction. To implement this Directive, on June 11th, 1948, President Ho Chi Minh made an Appeal for Patriotic Emulation. In this Appeal, he clarified his duty and people’s, saying that each Vietnamese, old or young, men or women, rich or poor, must become fighters struggling on a front which is either military or economic, political or cultural. Since then, the Appeal for Patriotic Emulation has infused all aspects of Vietnamese people’s life and become a key driver leading our revolution to numerous glorious victories in the wars for national liberation and protection as well as in today’s cause of Homeland building and safeguarding. 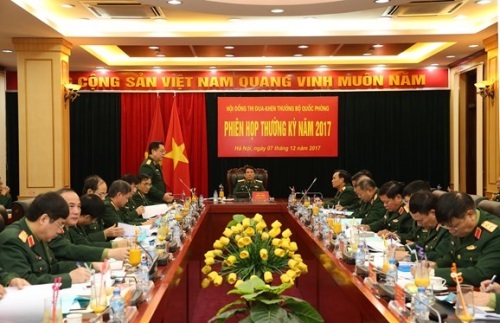 As far as the Vietnam People’s Army is concerned, grounded on Ho Chi Minh’s thought on patriotic emulation and documents, directive and guidance by the Party and the State on the work of emulation and reward, the Central Military Commission, Ministry of National Defence, General Department of Politics, all level party committees and commands have heightened a sense of responsibility for leadership and direction over implementing the Determined to Win Emulation Movement in the Military. As a result, the Determined to Win Emulation Movement has ceaselessly developed and directly contributed to encouraging cadres and troops successfully fulfilling every assigned task. Over the past 70 years, the Determined to Win Emulation Movement has always been in parallel with every operation and political task of each office and unit, and obtained practical effectiveness. Numerous heroic units and persons, valiant soldiers, “determined to win” soldiers, and soldiers of emulation emerged from the emulation movements, such as “Annihilating the enemy to achieve feats of arms” in the resistance war against the French Colonialists, “Determined to defeat US invaders” in the resistance war against the U.S., for national salvation, and “Determined to Win Emulation” in the cause of national construction and protection as well, which contributed to bringing revolutionary heroism to a new height and become a major source of politico-spiritual strength for the entire military to successfully fulfil each revolutionary phase’s political task to deserve Uncle Ho’s praises “Our Army is loyal to the Party, pious to the people, and is ready to fight and sacrifice for the independence and freedom of the homeland, and for socialism. They will fulfill any tasks assigned to them, overcome all difficulties and challenges and defeat all enemies”. Recently, the emulation and reward work has witnessed major changes in both awareness and method of organizing movements, while the mechanism in which the Party leads, commanders direct, political offices and councils for emulation and reward counsel has smoothly operated and demonstrated its effectiveness. At the same time, the Determined to Win Emulation Movement has been closely linked with the Politburo’s Directives 03-CT/TW and 05-CT/TW on the Party building and rectification (11th and 12th tenure), the Central Military Commission Standing Committee’s Directive 788-CT/QUTW on the Campaign “promoting tradition, devoting talent, deserving to be Uncle Ho’s Soldiers” as well as other movements and campaigns launched by sectors and mass organizations. Sectors have concretized those general movements into emulation movements and campaigns in line with their particularities, function and task, such as “Military logistics sector follows Uncle Ho’s teachings” by the Military Logistics Sector, “3 manifestations of the pinnacle of determination to win” and “Deserving to be Uncle Ho’s soldiers” by the Amy Youth Union, “Productivity, quality, effectiveness” by Military Trade Union, “Good teaching and learning, strict discipline management” by military academies and universities, and “Managing, exploiting weapons and technical equipment effectively, sustainably, safely, economically, and Traffic safety” by the Military Technical Sector. Moreover, cadres and troops have actively implemented the movements, such as “The Army joins hand in building new-style rural areas”, “The Army joins hands for the poor - no one is left behind”. It could be affirmed that over the past years, the Determined to Win Emulation Movement has always acted as a driver for the military to successfully fulfil the tasks of combat, combat readiness, training, natural disaster prevention and control, search and rescue, and maintenance of political stability and peaceful environment for the country’s development. At the same time, it has contributed to building strong, pure Party organizations, comprehensively strong offices and units, and exceptionally strong mass organizations as the basis for building a politically strong Army with the increasingly improved synergy and combat strength. In addition to recorded results, the emulation and reward work and the Determined to Win Emulation Movement have revealed some weaknesses. Awareness and responsibility of several party committees and commanders towards the position and role of the emulation and reward work have yet to be full. Attention paid to detecting, cultivating and multiplying typical examples has yet to be constant. The work of supervising, inspecting, assessing and reviewing the emulation movements has yet to be frequent. Those weaknesses have partly lessened the effectiveness and effect of the Determined to Win Emulation Movement in each unit and the entire military. Currently, the global and regional situation has complex, unpredictable developments threatening stability. Our people’s cause of national construction and protection has advantages and opportunities but faces difficulties and challenges, particularly during the process of national renewal and development and international integration. To fulfil the task of defending the Homeland, more than ever, the Military should continue to grasp and well implement President Ho Chi Minh’s Appeal for Patriotic Emulation, while encouraging the Determined to Win Emulation Movement as a huge source of mental strength to build revolutionary, regular, elite, gradually modern Vietnam People’s Army, deserving the Party, State and people’s confidence. To that end, due consideration should be given to the following. First, continuing to enhance the work of propagating the position and role of the emulation work in accordance with Ho Chi Minh’s thought to cadres and troops as the prime measure to bring the Determined to Win Emulation Movement to a new height. Reality has proved that when commanders of a unit successfully carry out the work of propagation and education to raise troops’ awareness and responsibility, that unit will successfully fulfil the task. Thus, this work must be highly valued and conducted regularly, constantly through diverse forms suitable to each group of troops. Importance should be attached to propagation within the units and via mass media. Propagation and education must focus on the Party’s viewpoints and Ho Chi Minh’s thought on patriotic emulation as well as higher echelons’ directives, resolutions and guidance on the emulation and reward work. Emphasis should be placed on the 11th Politburo’s Directive 34-CT/TW, dated April 7th, 2014, and the Central Military Commission Standing Committee’s Directive 507-CT/QUTW, dated July 28th, 2014, on continuing to renew the emulation and reward work in the Military, the 12th Party Central Committee’s Secretariat’s Directive 22-CT/TW, dated January 23rd, 2018, on enhancing the emulation movements to celebrate the 70th Anniversary of Ho Chi Minh’s Appeal for Patriotic Emulation, Prime Minister’s Directive 18/CT-TTg, dated May 19th, 2016, on launching emulation movements to successfully implement the 5-year Plan (2016-2020) according to the Resolution of the 12th National Party Congress. During the process of organizing the movements, due regard should be paid to multiplying “good people, good deed” examples as Uncle Ho’s teachings: “Using ‘good people, good deed’ examples to educate each other is one of the best ways to build revolutionary Party and organizations, and new men and lifestyle”. Consequently, a positive change in awareness and responsibility of party committees, commanders, cadres and troops, particularly key cadres at all levels, towards the emulation and reward work and the Determined to Win Emulation Movement will be made. At the same time, emulation ardour in all spheres of operation will be created among organizations, forces, cadres and troops. Second, enhancing leadership and direction of party committees and commanders at all levels over the emulation and reward work and the Determined to Win Emulation Movement. The emulation and reward work and the Determined to Win Emulation Movement should be seen as a focus in all operations of a unit. Grounded on Ho Chi Minh’s Appeal for Patriotic Emulation, guidelines, targets and contents of emulation set by the 9th Army-Wide Determined to Win Emulation Congress, and particularities and task of their office and unit, party committees and commanders should establish specific contents and targets for emulation. Focuses of emulation should be placed on performing political task, enhancing the studying and following of Ho Chi Minh’s thought, ethics and lifestyle, conducting the Party and political work, and realizing “three breakthroughs” set by the 10th Military Party Congress. Each cadre and party member should promote their vanguard, exemplary role in grass-roots level emulation movements while fighting against manifestations of disregarding and considering the emulation and reward work as responsibility of political offices and cadres. Commanders at all levels should flexibly direct and organize the movements and take the results of emulation to build pure, strong party organizations and comprehensively strong unit as the basis for all-level cadres’ task performance. At the same time, the role of political offices, Council for emulation and reward and mass organizations in counselling, directing and guiding emulation should be promoted. Only by doing so could the Determined to Win Emulation Movement satisfy the requirements and contribute to improving troops’ political stuff and working style and method, and units’ combat readiness level and capability, training quality, and task performance. Third, renewing the method to organize activities of emulation and reward and the Determined to Win Emulation Movement. Units at all levels should continue to renew the way of organizing the Determined to Win Emulation Movement on a practical, grass-roots unit-centered basis. Significance should be attached to improving the quality of developing plans and building targets, driver and determination for emulation; associating regular emulation movements with peak, breakthrough emulation period, emulation movements and campaigns launched by sectors and mass organizations, particularly the studying and following of Ho Chi Minh’s thought, ethics and lifestyle. To organize an emulation movement, it is important to closely follow 4 steps: formulating plans; launching; adopting measures to organize the movement and reviewing it. Besides, due attention should be paid to renewing forms and methods to launch the emulation movement in a simple, practical manner. It is vital to regularly combine the Determined to Win Emulation Movement by the Military with the Patriotic Emulation Movement by localities, sectors, organizations to create the synergy for successfully fulfilling every task. Fourth, successfully conducting the work of detecting, cultivating and multiplying typical examples in the Determined to Win Emulation Movement. Setting up and multiplying typical examples in the Determined to Win Emulation Movement will not only encourage people doing good deeds but act as a practical measure to create the diffuse of the Determined to Win Emulation Movement. Moreover, it is necessary to build and complete the system of criteria for typical collectives and individuals as the basis for striving, evaluation and commendation; to closely combine the multiplication of typical examples in the Determined to Win Emulation Movement with the implementation of the 12th Politburo’s Directive 05-CT/TW, the Campaign “Promoting tradition, devoting talent, deserving to be Uncle Ho’s Soldiers” and other emulation movements and campaigns. This work must be carried out in a public, democratic, close fashion right at the grass-roots levels. Collectives and individuals who are applauded and rewarded must be really outstanding, especially those in the isolated, remote, border, sea and island areas. In order that typical examples could well perform their role in reality, units should promote the combined strength of organizations and forces to give them opportunities to improve themselves in hard, complex environments. At the same time, due regard should be paid to improving troops’ material and mental life, ensuring that typical examples could train and develop enduringly in the Military. Fifth, closely combining emulation with reward, creating an incentive to encourage the Determined to Win Emulation Movement in offices and units. Emulation serves as the basis and criteria for reward while reward represents an incentive to develop emulation movements. Therefore, units at all levels should associate emulation with reward and maintain the order for this work in a public, democratic, equal, accurate, timely manner. During the process of voting rewards for emulation, it is necessary to follow higher echelons’ guidance and regulations and examine the results of implementing criteria for emulation by each collective and individual. Significance should be attached to promoting the role of the councils for emulation and reward and the political offices at all levels; to improving virtues and professional competence of cadres in charge of the emulation and reward work. At the same time, party committees and commanders at all level should increase the work of inspection and supervision, correctly assessing the results and achievements to bring into play strong points and overcome weaknesses, opportunely detecting and combating the “achievement disease” and negative phenomena in the emulation and reward work, ensuring the Determined to Win Emulation Movement follows the guidelines and obtains the practical effectiveness. Commemorating the 70th Anniversary of Ho Chi Minh’s Appeal for Patriotic Emulation, the entire Military should further enhance the Determined to Win Emulation Movement, creating a driver for successfully fulfilling the task of building the Military, strengthening national defence, building and safeguarding the socialist Homeland of Vietnam in the new situation.